Cotton Candy Mint (mentha 'cotton candy') - Westerfield hybrid. 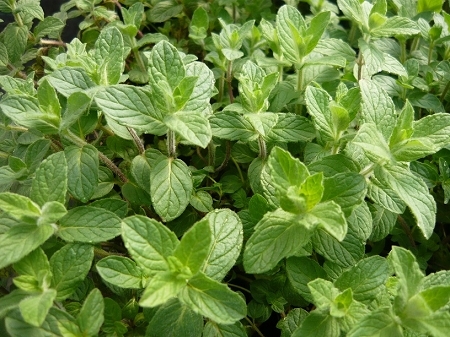 Interesting culinary and tea mint with a soft silver/green leaves and pretty pink flowers when in bloom. Perennial zones 6-11. Live plant in 3 inch container. I have just made a purchase of over 25 different herbs from this nursery including this great smelling Cotton Candy mint plant. Interesting scent of mint at first, that is followed up by a sweet, yes cotton candy like smell. I buy herbs from many Nursery's Colonial Creek is the best ever. Every herb arrived in perfect shape well established and very healthy and a great size ready to transplant and take off growing. Love these people, plants obviously were grown and cared for with a lot of TLC. I normally would not take the time to comment on every plant purchased but this Nursery deserves it. And the price is a true bargain for the quality. I Highly recommend this grower. Love the smell of this plant. Has a really sweet scent and flavor. Was packaged well and not damaged.